In honor of Independence Day, July 4th, I have designed this sweet little dish cloth, which can also be used as a wash cloth if you prefer. 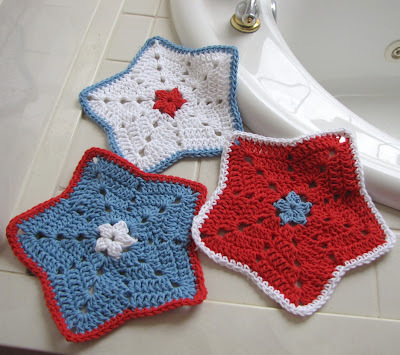 It is quick and easy to make, and looks very patriotic in red, white and blue. But I think it makes a very cute little wash cloth made in other colors, too. I know a little boy who will be getting some new washcloths soon! Size: About 9” across at widest point. Rnd 6: Join Edging Color with sc in any ch-2 sp, 2 more sc in same ch-2 sp as joining, sc in each of next 8 sts, skip next 2 sts, sc in each of next 8 sts, *3 sc in next ch-2 sp, sc in each of next 8 sts, skip next 2 sts, sc in each of next 8 sts; repeat from * around, join with sl st in first sc. Fasten off. Copyright BellaCrochet 2010. All rights reserved. This pattern may not be shared or redistributed in any way. Wow what a pretty dishcloth, bath cloth, facecloth. I just love it and have saved it so that I can get to it quicker. Thank you so much. You are welcome, Barbara! I hope you will enjoy it! These are beautiful. How sweet of you. Thanks for your pattern and happy 4th of July!!! Happy 4th of July to you, also! Those are wonderful, thank you!! Those are so pretty. Thank you. I think they could be used at Christmas, too, in the right colors. I agree, Joanna! I think they would be really cute in Christmasy colors. Thanks for such a cute pattern! I just bought some I ♥ This Cotton and now I know what I will do with it! Thanks again for sharing your creativity! I worked one of these up last evening and the kids were arguing over who gets it for their future...making more now! LOL It's a great pattern and works up really fast. Thanks for sharing! These are so cute. I love the centre pattern. Thanks for sharing your design. I can't wait to try these. They're really cute. Thanks for sharing. I'm following you on GFC & FB. I love these made them in Christmas colors, used red for star center, variegated for body of star and green for the edge. 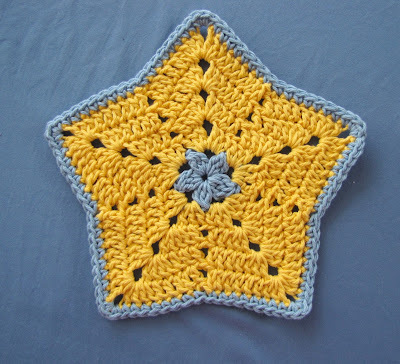 I did two rows of edging instead of one and put three sc in the middle corner sc of star point. On round 6 you say you can start in any ch-2 sp, but you have to start in a ch-2 sp at the one of the tips not in the decrease. I'm also going to join two of these together to make hot pads. This is a great pattern, thanks for sharing. I am glad you like them, Anonymous! But the decrease is not a ch-2 sp; the only ch-2 sps are at the points. So you can join in any ch-2 sp, as the pattern states. Hi. I just found out about Ravelry 2 days ago. So fun. I live 1.5 miles from the beach. The first thing I thought of when I saw these adorable wash clothes was 'Sea Stars!!!' Can't t wait to make a few for my kitchen. Thank you so much for sharing. I have a dear friend who loves red-white-blue items. Now I have to make her some of these! I have saved this pattern to make soon!! Love it :) thanks for sharing. LOVE this pattern! Thank you for sharing it with all of us! Made my first one tonight, and it works up very quickly and easily. Perfect stash-buster design, and sooooo cute! Can't wait to try more colors and sizes (sport yarn maybe)! I just found this on Pinterest, grabbed a hook and got started. Thanks for sharing your pattern. 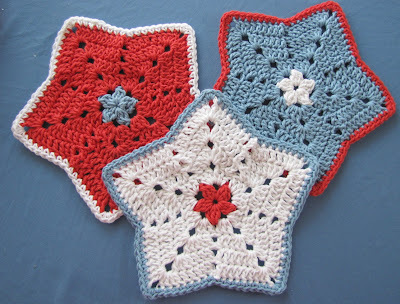 I am making up a bunch in red, white and blue for the 4th Picnic. I can't wait to Wow everyone with my festive table decor. Thanks! Thank you for the pattern! I made one change that gave the points on the star a bit more pointy-ness. Instead of doing three single crochets in each 2-chain space, I did *sc, dc, sc* in each 2-chain space. It looks awesome! Thanks again! Thank you for this wonderful pattern. 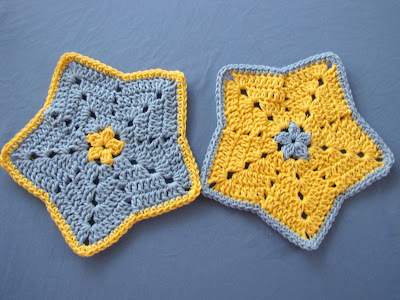 I made a potholder/trivet using your pattern. I made 2 'stars' and instead of putting the edging stitch on each I just used the final single crochet row to join the 2 pieces together. 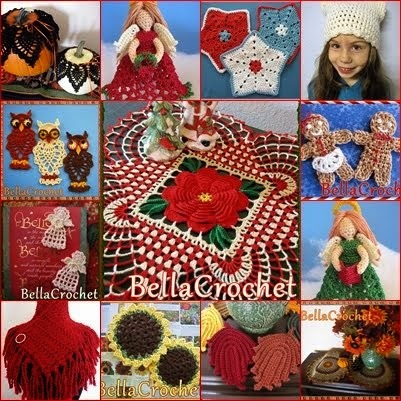 Makes a perfect potholder or trivet. Love it. I absolutely love this pattern. Thank you so much for sharing it. I have just finished one of these and it turned out really nice. At first I thought that it might be too difficult for me, but I am happy that It wasn't the case. Thanks, just worked this in one colour and it came out lovely. Just what I needed in my new year haze of sleep deprivation. Love the pattern!! I've made several in Christmas colors. Does anyone have any cute ideas on how to package them for gift giving?